Casco Bay stretches far and wide, with only a few rugged islands marking its eastern outer reaches along the edge of the open ocean. Jewell Island is the most prominent and also the friendliest toward human visitors. Even though it lies less than 8 miles from the Portland waterfront, it feels remote and wild. And it's a big enough island that there's a lot to see and explore. On a visit to Jewell, you’ll discover ecological wonder, military relics, miles of trails to explore and beachside campsites right on the edge of the vast Atlantic horizon. As her name suggests, Jewell glistens amongst the many shining islands of Casco Bay. Because it's far from the mainland, and several islands stand between you and Jewell, there are naturally many routes to choose from. I’ll write the most scenic route for this description. Modifications are straightforward if you’re adept at chart navigation, which you should be if you're heading out this far! Depart from East End Beach and cross to Fort Gorges, the ominous stone structure standing on Hog Island about one nautical mile offshore. This crossing can involve strong tidal currents (especially on the ebb tide), and heavy boat traffic. Be aware of the status of both. Winds are often light after embarkation, but halfway through the crossing they can suddenly increase. That’s because the hill of eastern Portland usually blocks the prevailing Southwesterlies of summer. To get a prediction of the wind you will encounter on this crossing, observe the flag flying just north of the fort. If it’s fully extended, the wind is greater than ten knots. The Southwesterly will help you on this trip out! Completed in 1865, Fort Gorges is a Civil War era artillery battery, open to the public. Go ahead and stop here if you’re curious about it, but be careful of the many hazards inside, most of which are structural and trip/fall related. Cross to the Little Diamond Island Casino, which is the large brown building with the maroon roof on a pier extending from the southwest shore of Little Diamond. Between Hog and Little Diamond Islands, you’ll cross the escape channel for the Navy’s anchorage in inner Casco Bay during the Second World War. It’s delineated with red and green buoys. Lobster and tour boats cruise through here, so look out, and smile and wave at strangers. Completed in 1905, the Little Diamond Island Casino was once a family affair. Islanders of all ages played games and cured boredom here. Nowadays, it’s used as a rain shelter for patiently waiting ferry passengers. Paddling north, to your east is the most densely populated island in Maine: Peaks Island. In the summer months, its population swells to 7,000. By winter, it dwindles to 800. There are public restrooms on Peaks Island. If you land on the sandy beach just north of City Point, you can walk up the road to the public library and find a wonderful, welcoming toilet. Paddle along the east shoreline of Little Diamond Island. On this side of Diamond Pass, the water is deep, and larger boats, like the ferries, move close to the shore, so keep your eyes peeled. As you progress to the north and trace the edge of Great Diamond Island, tall cliffs and thick deciduous trees reach above in stunning displays. Ospreys live atop this island. Look skyward, and listen for their distinct, high-pitched staccato cries. As you reach Hussey Sound, Peaks Island’s Evergreen Village fills out the trees to the east, with Pumpkin Nob just off its steep shore. The nob was once a summer home of John Ford, the film director. This is an interesting four-way intersection of waterways, their borders being Great Diamond, Peaks, Long, and Cow Islands. You’re heading northeast now, out toward the open sea! Great Diamond Island was the home of Fort McKinley, constructed in the early 1900’s and manned until the end of World War II. Nowadays, the whole island is privately owned. Cow Island is owned by Ripple Effect, and has its own old military bunkers jutting out from the trees. Long Island became its own town in 1994 and the residents are very proud of that fact! Hussey Sound is the second deepest channel on the Eastern Seaboard after Norfolk, VA. When paddling here, you almost always feel the temperature drop a bit, and the sea behave differently. Long swell from the deep-sea rolls through, clangs the bell buoys, and washes over shores’ edges. From this point to Jewel Island is very exposed, so make a solid assessment of the conditions, and your preparedness, before setting forth. 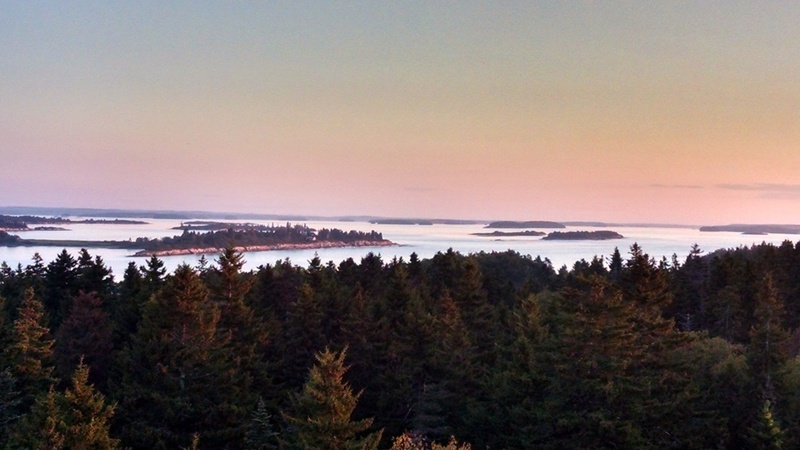 If you don’t feel confident, you could still do an overnight on Cow or Little Chebeague Islands. Cross to the outside of Overset Island, because even at high tide it’s tricky to cross the breakwater that connects Overset and Long Islands. Vail Island will be the last chunk of land you encounter before crossing to Jewell. You’ll want to get a compass bearing and monitor your lateral movement as you cross, because it’s far, and the tide and wind can have a profound affect on you over the roughly 2 nautical miles of paddling. If the summer Southwesterly blows, it will assist you on this crossing. If you find yourself in trouble midway through this crossing, it’s usually best to paddle north, because the wind will assist you, and you’ll be able to land either at the north end of Long Island or at Cliff Island, both of which have public access, food, and ferry service. As you cross, if the sky is clear, you’ll see Portland Head Light (1791), the oldest lighthouse in Maine, flash its powerful beacon at you from the southwest. Ram Island Ledge Lighthouse (1905) is the brown tower just in front of Portland Head. To the west is the exposed and rugged east coast of Long Island. To the north, islands scatter like ecological candy, growing less populated and more beautiful with each mile. And to the east: the mighty North Atlantic in all her glory. Next point of land: Portugal. Jewell Island’s northern and southern coasts are tall and bold, and the east shore is rocky and exposed. The only consistently accessible area is the beach in Cocktail Cove, where gently sloping beach extends to the water’s edge. There are many campsites on Jewell. Each campsite has a fire ring, water bucket, and often some tinder. My favorite is the one atop the grassy hill near the big oak tree. During the summer months, an island caretaker lives in the shack on Little Jewell Island (just west of Cocktail Cove). This person takes care of the island and promotes ethical behavior of visitors. I don’t want to tell you all of the secrets of Jewell, because exploring her for yourself is part of the fun. But two things you shouldn’t miss are the World War II submarine tower, and the Punchbowl. There are two towers on the island and both are open. The taller one naturally has better views. If you watch the sunset from this vantage point, you will not be disappointed (weather cooperating of course). The smaller tower has roof access, which is fun, but be careful! The Punchbowl is a huge tide pool, replete with more marine life than any aquarium. You can often find live lobsters here! The lighthouse you see about three miles east is Halfway Rock Light (1895), atop Halfway Rock, named because it’s roughly halfway between Cape Elizabeth and Small Point, the two ends of Casco Bay. By night you can see the lighthouse flash a red light. Beware the raccoons of Jewel Island! They are huge, fearless, and their search for food is insatiable. They will eat through dry bags, work hatch covers off of boats, and make evil sounds in the night. You should consider a bear-hang with all of your edibles, including toothpaste. Kayak overnights bring with them a greater risk of un-foreseen changes in weather and sea conditions, and medical emergencies. Jewel Island sits in an exposed position on the Maine Coast, furthering this concern. Cliff Island is due west of Jewel, and the crossing from Jewel to Cliff is relatively protected from waves. If you find yourself questioning whether or not you can safely paddle home from Jewel, you can almost always paddle to Cliff Island and then take the Casco Bay Lines ferry home with your boat. The ferry crew knows how to handle this, because they do it often! This is true with heavy fog as well. You can buoy hop with a solid compass bearing to Cliff Island in the fog (use your chart!). On your return voyage, you could either backtrack, or head around the north coast of Long Island and then onward through the inner islands if you prefer a variation in scenery, or if the weather has changed. A NOTE ABOUT SAFETY: Sea kayaking responsibly on Maine's coastal waters requires preparation, skills and knowledge. Casco Bay is a potentially dangerous environment due to its very cold waters, busy boat traffic and exposure to the conditions of the Atlantic Ocean (including sudden fog and strong winds). This is why we encourage people to take our lessons or join our guided trips before venturing out on their own. One fundamental skill that is essential for sea kayaking is the ability to rescue someone from a capsize. It can be extremely difficult to re-enter a kayak in cold and turbulent water. Anyone who paddles in the exposed waters of Casco Bay without this knowledge (or someone else who has that knowledge) is taking an extremely high risk. Sign up for our "Rescue Clinic" to learn these rescue skills.